Intex, yesterday, officially launched a new budget smartphone, the INTEX AQUA 5.0 Smartphone/Phablet. It is a 5 inch-ed Android based smartphone and is proced at Rs.9,990. It is the successor of the previously launched Aqua 4.0. It sports a 5-inch capacitive multi-touch display with 800 x 480 pixels resolution. It is powered by a dual-core processor bundled up with 512 MB of RAM and 4 GB of onboard storage which is expandable upto 32 GB via microSD Card. The device is equipped with a 5 MP Rear Camera with autofocus and LED Flash and a 1.3 MP Front Facing Camera. The device supports 3G, Wi-Fi 802.11 b/g/n, Bluetooth 2.0, GPS, 3.5mm audio jack, FM Radio. Under the hood, there lies a 2,000 mAh battery. The device supports SIM modules in dual-SIM (3G WCDMA+2G GSM/GPRS/EDGE) configuration. The device comes preloaded with various applications such as Flipkart, Indian Rail, Nimbuzz, Skype and YouTube. It is equipped with Gravity, Light and Proximity sensors and supports Auto Call Recording feature. The device is available in three colours - silver, blue and black. Aqua 5.0 is also Intex's first dual core processor bearing smartphone. As an introductory offer, Intex bundles a backpack worth Rs 700 that includes a 4 GB memory card pre-loaded with games and NQ anti virus. Intex Aqua 5.0 will be sold in India for Rs 9,990. 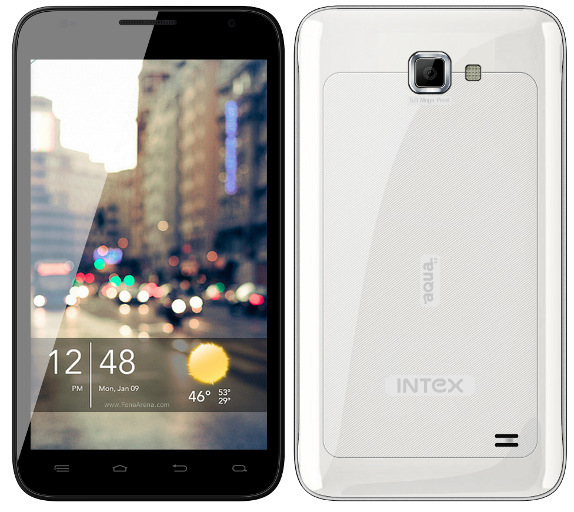 0 Respones to "INTEX AQUA 5.0 Launched : Priced at Rs. 9,990"